Venerable Lho Ontul Rinpoche is our beloved founder and spiritual adviser and teacher. Born in Tibet and recognized at a young age as an emanation of Nuden Dorje, Ontul Rinpoche is an extraordinary high lama in the Drikung Kagyu lineage of Tibetan Buddhism. Rinpoche resides at Tso Pema monestery in India with his family, including his son, Karma Ratna Rinpoche. Together, the father and son travel and teach students throughout the United States, Canada, and Europe. Ontul Rinpoche at Drikung Terdom, 2010. 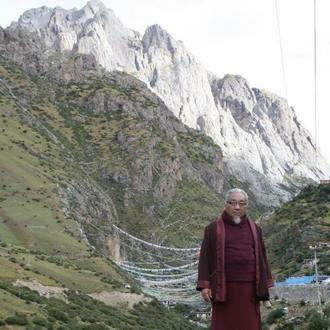 Behind Rinpoche is the rocky mountain known as Tsogkhang Kyiri Yangzong, the Treasure site of the Yangzab Dzogchen Cycle of teachings, revealed by the 17th throne holder of the Drikung Lineage. Venerable Ontul Rinpoche is the 3rd incarnation and he was officially recognised at the age of five in Tibet. Rinpoche's previous incarnations are connected with Drigung Orgyen Nuden Dorje, a great discoverer of hidden teachings (terton) of the last century. He was well known as an emanation of Nyang Ban Tingdzin Sangpo, a great master at the time of the 8th-century Tibetan emperor Tri Song Deutsen. The previous Ontul Rinpoche had fallen sick before his death and had a deep wound on the left-hand side of his waist. Upon birth, the 3rd Ontul Rinpoche had a scar in the exact same place. While Rinpoche was still in his mother's womb, the family travelled to Ri-chi-thuk, a place of pilgrimage in Tibet. On the way, as they journeyed across rough mountainous terrain, his mother was about to fall into a deep valley. Then all the travelers heard a voice saying "Save my mother!" Everybody was amazed as the voice came from inside the mother's womb. It was Rinpoche trying to save his mother's life. Rinpoche escaped from Tibet after the Chinese invasion with his teacher Kharnam and his followers; travelling overland he reached Nepal in 1960. Then in 1962 Rinpoche entered India where he did retreat and studied with Khenpo Thubten in the holy place of Tso Pema until 1965. At that time Rinpoche and a group of practitioners established a spiritual community in the hill-station of Dharamsala where they did their practices in a simple tent. At the first ceremony in Tso Pema on Guru Rinpoche Day (Tse Chu) they pitched a tent and performed pujas next to the holy lake. Rinpoche invited Khenpo Thubten to give teachings and studied with him until 1970. After that Rinpoche travelled to Ladakh on a teaching tour and bestowing empowerments on the Himalayan Buddhist people. Through the offerings received, he purchased land in Tso Pema and started to construct a monastery in 1971. The temple of the monastery took several years to complete and was finally finished 1975. Rinpoche received Mahamudra and Dzogchen teachings from H.H. Dalai Lama, H.H. Kyabgon Chetsang Rinpoche, H.H. Dudjom Rinpoche, H.H. Dilgo Khyentse Rinpoche, H.E. Garchen Rinpoche, Yogi Pachung Rinpoche, Polu Khenchen Dorje Rinpoche, Ven. Khunu Lama Tenzin Gyaltsen, Kyabje Kalu Rinpoche, Khenpo Khedrup Rinpoche and others. Rinpoche also received teachings from Yogi Chyunga Rinpoche and his personal instructions on the Drikung Kagyu Five-Fold Profound Path of Mahamudra. In the years that followed Rinpoche went to Drikung Kagyu Monasteries in Ladakh where he received most of the important empowerments, instructions and oral transmissions of the Drikung Kagyu tradition from H.E. 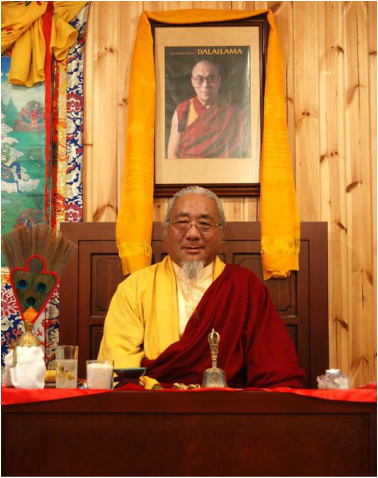 Choje Togden Rinpoche. Today Rinpoche is still in the monastery at Tso Pema, where he spends his time teaching his followers from all over the world. More bio material. . .
Lho Ontul Rinpoche is our beloved founder and spiritual leader. Rinpoche's previous incarnations are connected with Drigung Orgyen Nuden Dorje, a great discoverer of hidden teachings (terton) of the last century. He was well known as an emanation of Nyang Ban Tingdzin Sangpo, a great master at the time of the 8th-century Tibetan emperor Tri Song Deutsen. The elder brother of Nuden Dorje and first Ontül was Kunzang Drodul. He was born into a noble family lineage in the village of Zalmo Gang in Kharn province of Eastern Tibet. The 5th Drigung Kyabgon Chetsang Rinpoche Thugje Nyima (1828- 1889) recognized him to be the emanation of Drog Ban Khiu Chung Lotsawa, one of the twenty-five main disciples of Guru Padmasambhava. Since Kunzang Drodul was the elder brother of Orgyan Nuden Dorje, his successive incarnations are known as Ontül, which means "the incarnation of the elder brother". The present Ontül was born in Kham Nangchen in Eastern Tibet in the year 1950. Ontül Rinpoche's family lineage is called Göpe, or also Pebön Thogtrul, which is one of the thirteen noble family lineages which are again explained as stemming from the inner lineage of Lodan Nyingpo, who is one of the four ancient Tulkus of Bön religion, before Padmasambhava's time. In 1954, His Holiness The 7th Drigung Kyabgon Chetsang Rinpoche and His Holiness the Gyalwa Karmapa Ranjung Rigpe Dorje recognized Ontül Rinpoche as the incarnation of Ontül, and was given the name Konchog Tenzin Thrinle Rabgye Palzangpo. Accordingly, in the same year Ontül Rinpoche was enthroned in the Monastery Dong Med Ogmin Thubten Shedrub Ling. 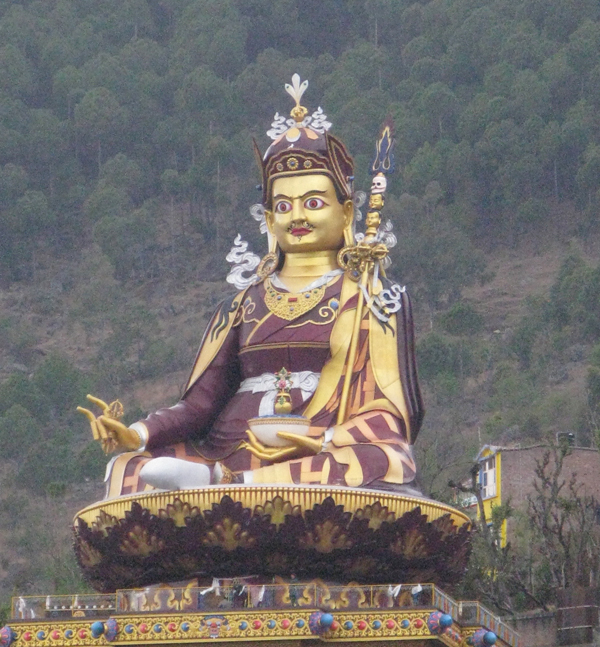 Lama Kalsang Namgyal, the attendant of his previous incarnation, took the responsibility for giving him basic education such as in reading and writing, reciting texts, etc. In 1959 when the Chinese Communist army occupied Tibet, his tutor Kalsang Namgyal and Ontül Rinpoche left their home monastery and, together with many monks and people of their village, they began their flight from Tibet to India. On the way they experienced terrible thirst and hunger, and were constantly threatened by the Chinese soldiers. In spite of many difficulties, they managed to cross the Tibetan border and arrived in India through Nepal. Life in India was also not easy because we did not have a place of their own to settle down. They were forced to wander from place to place for almost fourteen years. In India, again Ontül Rinpoche met with Drigung Khandro Neni Rinpoche (mkhn' 'gro or dakini signifies a highly realized female yogi). She introduced Ontül Rinpoche to Ven. Khenpo Thubten, a great Nyingmapa teacher. The first teaching which Ontül Rinpoche received from the Khenpo was an extensive instruction on the Longchen Nyingthig Ngöndro practice. Later Ontül Rinpoche received teachings from Khenpo Thubten on several other important texts. On different occasions Ontül Rinpoche received Mahamudra and Dzogchen teachings from H.H. Dudjom Rinpoche, Khunu Lama Tenzin Gyaltsen, H.H. Dilgo Khyentse Rinpoche, 3rd Kalu Rinpoche and others. From the Yogi Khyunga Rinpoche, Ontül Rinpoche received teachings and his personal instructions on the fivefold profound path of Mahamudra. In the years which followed, Ontül Rinpoche went to Ladakh where he received most of the important empowerments, instructions and oral transmissions of the Drigung Kagyu tradition from H.E. Chöje Togden Rinpoche. Ontül Rinpoche spent several years in Ladakh and travelled with Togden Rinpoche extensively in Ladakh to visit several Drigung monasteries with him. After coming back to India, in 1971 Ontül Rinpoche bought a piece of land at Tso Pema (Rewalsar, H.P.) from the donations which were received from the people of Ladakh. With the help of resident monks, Ontül Rinpoche managed to construct a monastery on this piece of land. Tso Pema means the "Lotus Lake," and this is one of the sacred places where Guru Padmasambhava demonstrated his miraculous powers. The purpose of his exhibiting miracles on that place was to subdue the king and the people of that region, which was then known as Sahor. It took many years to complete the monastery with the sacred objects, ritual instruments, and other necessary things. Now the monastery is complete and many monks reside there, maintaining the tradition of the Drigung Kagyu. In 1978 H.H. Drigung Kyabgon Chetsang Rinpoche recognized the 7th incarnation of the Terton Ogyen Nuden Dorje and gave him the name Konchog Lhundrub Nyendrag Namgyal (Lho Bongtül Tendzin Nyima). At that time the young Tulku was only three years old. In 1980 he was enthroned as the spiritual head of our monastery. At present he is studying at the Drigung Kagyu Institute in Dehra Dun, U.P., India. In 1983 Ontül Rinpoche made a journey to central Tibet and Kham, his first visit to Tibet after escaping in 1959. First stopping in Lhasa and then after making a short visit to Drigung Til, Ontül Rinpoche traveled to his main monastery in Eastern Tibet. It was one of the bigger Drigung monasteries in that area and it is located close to his birth place. During the Cultural Revolution the main monastery was completely destroyed. Through the effort of three Tulkus (Tulku Thupnying, Gyaltsep Tulku, Tulku Phuntsog), and Lopon Gonjam, monks, and the local people it is being rebuilt now, some parts have already been completed. There are about one hundred monks, some of them are in retreat of "Chagchen Ngaden". Since Yogi Pachung Rinpoche passed away, they are guided by his main disciple, Ven. Gelong Tenzin Nyima. In this area Ontül Rinpoche spent almost six months attending several ceremonies in monastery, giving empowerments and teachings to the monks and local people. Ontül Rinpoche also initiated "Vajrakilaya Drüpa" (annual ritual) in our monastery and since then it is done for ten days annually. The Monastery has several branch monasteries, among them is Bumang Monastery. Their Preceptors passed away during the Cultural Revolution. The new reincarnation, now eleven years old, was recognized by H.H. Drigung Kyabgon Chetsang Rinpoche and at present is studying in Drigung Kagyu Institute, Dehradun, U.P., India. Ontül Rinpoche's main monastery also has one branch nunnery which was destroyed completely by the Chinese communists. Since 1993 it is under reconstruction and some nuns are practising Dharma there. From Kham, Ontül Rinpoche returned to Drigung in Central Tibet in the autumn of the same year. At Drigung Til monastery he had the opportunity to meet Yogi Pachung Rinpoche. From him Ontül Rinpoche received oral transmissions and teachings, which he, together with Ven. Gelong Tenzin Nyima, repeated thoroughly and then practised. During this time Ontül Rinpoche met H.H. Drigung Kyabgon Chungtsang Rinpoche who was residing at Lhasa.